When did you start to play tennis? I think I was about 13. I had wanted to start when I was younger, but the local coach my parents knew didn’t train young children. I finally played with my brother and some friends and basically picked up a racquet and could play. I played once more with my dad and my third time on a Tennis Court was in a match. It was an uphill struggle to learn to play as I had to wait 18 months to get into the local club – the waiting list was 2 years, but my mum got fed up with me hitting a ball against a wall of the house for hours every day. I’m surprised there wasn’t a dent. I stopped playing when I went to university and started again just 4 years ago. Why did you start playing again? I missed it and decided that it was about time I started playing again for me. It’s something I’ve always loved and should never have stopped playing. When I was growing up, I went to Wimbledon a few times with the school and queued for hours to get in. At that time there was standing room on centre court, which meant queuing again, but it was worth it. I saw Boris Becker play in his first ever Wimbledon, I saw John McEnroe, John Llyod, Billy Jean King, Chris Evert, Yannick Noah and many others. Who do I most admire? Well, I was a big fan of Agassi and really enjoyed his book. I believe Sampras, Federer, Navratilova, Steffi Graf, the Williams sisters, Federer, Nadal & Djokovic have taken the game to a whole different level and I have enormous respect for them all. I do believe though that at the moment there are so many good players that predicting who will win a Grand Slam is so hard – I really can’t remember a time before when it was so competitive. At any other time, Andy Murray would have won a Grand Slam. I’m definitely looking forward to seeing what happens in 2012 and seeing who realises their potential. What is the best part of your game? Well, it’s always evolving. Even the top players in the world are always trying to add that extra bit to their game. A coach should be the same – we are always looking to improve our own game and find better ways to teach. It never stops. My serve has been a strong point, but at the moment (in the close season) I am modifying it so I would say it is not such weapon currently. It should come out of these changes better than ever. I have also always believed in the importance of the return of serve (inspired by Andre Agassi) and can return most serves. I often play against men and have never felt I’ve lost because they are men – it’s been because I have made more mistakes. I would like to become more consistent. I have worked on this and have improved, but if you look at the statistics, something like at least 65% of points at the highest level of the game are lost by a player making a mistake and not by him/her making a winning shot. It’s something I always emphasise to my pupils. Why did you become a coach? I love tennis and I wanted to play tennis every day. I’d taught a few people to play and enjoyed doing it. The opportunity came up and I took it. My youngest pupil is 3 years old and I believe he will become a good player. I also do a number of After School Clubs as I believe it is very important to work at the grass roots level. I also enjoy it. My main goal though is to ensure the children have fun and learn to love tennis and sport in general. I’m a big believer that tennis, more than any other sport, teaches sportsmanship, courtesy and respect for your opponent as well as many other great qualities. I teach adults as well, from beginners through to advanced players using a blend of different techiques, adapting my teaching to suit the pupil. Everyone is different, everyone’s brain works slightly differently and my job is to find the best way for each pupil to learn. There are obviously common factors, such as whether you learn better using visual, more technical/analytical, or more sound driven etc. Again, I make sure people have fun. Tennis is actually a really good way to get fit, so some of my pupils do tennis instead of going to the gym because they can never get motivated by running on a treadmill. My pupils are all nationalities, including British, Bulgarian, Cypriot, Greek and of course Russian. I hold my classes in English, Greek, French and less fluently in German, Spanish and Russian. I’m certainly working on improving my Russian at the moment. 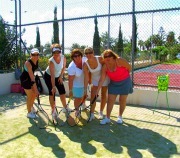 What is your opinion of Tennis in Cyprus? The Cyprus Tennis Federation (CTF) does quite a good job with the juniors, but nothing much for adults and especially women. Unfortunately there are very few women competing in tournaments in Cyprus, but hopefully this will change – I’m doing as much as I can to encourage it. What I think is lacking is inter-club tournaments. There should be regular Tennis Matches between Tennis Clubs and ideally schools as well. This would help improve the standard of play, giving players something to aim for and hopefully motivating more people to compete. Are there tournaments you can play in? Absolutely. There are the official CTF tournaments, for which you need a medical card and to apply for membership. You can find out more info here. Also, there a several amateur tournaments such as the ATL and Mad4Tennis. You don’t need a card for this and the ATL, for example, runs different levels of tournaments and a league, so that complete beginners playing their first ever match can take part, as well as semi-pros. This is very important as there are players of all nationalities taking part, some of whom have competed in their home countries. This makes it far more competitive and will bring up the level of tennis in Cyprus as a whole. After all, that is our goal.